Chakras are entry gates of the aura. 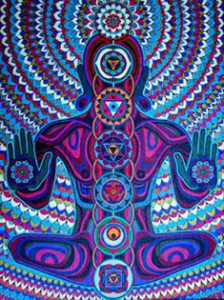 Within the physical body resides a spiritual body that contains the chakras. The word Chakra in Sanskrit translates to wheel or disc. The chakras are centers of activity that receive, assimilate and express life force energy. They are responsible for each person’s physical, mental, and spiritual functions. They absorb and transmit energies to and from the universe, nature, celestial entities, people and even things. According to the traditional writings there are 88,000 chakras in the human body covering basically every part of the body. The majority of them are small and insignificant. 40 of them have significant function and they are located in the hands, feet, fingertips and shoulders. The most significant ones are known as the Seven Main Chakras and they are located along the central line of the body, from the base of the spine to the top of the head. They are located in the ethereal body and they express the embodiment of spiritual energy on the physical plane. Chakras are constantly rotating and vibrating. The activity in the chakras influences our body shape, glandular process, chronic physical ailments, thoughts and behaviors. When one of more chakras is blocked and the energy is unable to flow harmoniously through them, or it is wide open, the result will be an imbalance that is manifested through all areas of life. Each chakra is expressed on the physical body in one of the endocrine glands that regulate physical and emotional processes in the body. The imbalance in the chakra will also be expressed in the endocrine gland linked to it.